Love seafood? 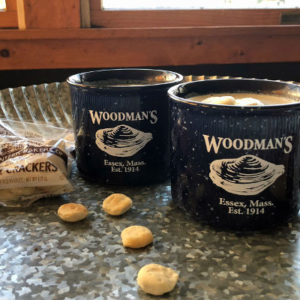 Get the taste of New England delivered right to your kitchen when you buy fresh clam chowder online from Woodman’s. It’s the perfect gift for the seafood lover on your list! Our award-winning family recipe is a true New England clam chowder, and is FRESH – NOT from a can! This gift set comes with two Woodman’s souvenir mugs! A customer favorite, no one can resist it!